IoT or ‘Internet of Things’ is poised to become the next wave of technology that will fundamentally change how we work, play and interact with our environment. It is unfolding as a “swarm of intelligence” across all geographic industrial and technological borders, creating gadgets and gizmos that speak the same language. IoT has started a revolution driven by visionary developer’s rapidly gathering momentum as they create a future of physical and virtual objects with unique identities that will connect us to the internet in ways that we never imagined possible. The future Is bright, the future Is IoT. The tech world defines IoT as the interconnections of uniquely identifiable embedded computing devices within the existing internet infrastructure. IoT is a term proposed by Kevin Ashton in 1999 through the Auto-ID Centre at MIT, to describe a wireless network of “things” that communicate without human interaction. Hosain Rahman, founder and CEO of Jawbone points out that the ‘Internet of You’ is a term he prefers over IoT. He reasons, that IoT needs an organising principle that is “less about the ‘things’ and more about the people at the center of those things”. Defining IoT goes hand in hand with the question, how useful is IoT ? In order to understand its usefulness, one can take a closer look at how businesses and consumers can benefit from IoT. Rapidly expanding businesses are becoming ‘smarter’ by adopting IoT innovations. IoT has successfully brought about improvement in industries such as (i) Healthcare, (ii) Manufacturing and (iii) Retail. In my opinion, Healthcare is the industry that is and will continue to help the most from the advancement of IoT. Imagine, a cloud platform that enables medical tools and devices to allow hospitals to collect, record and analyse data more accurately and at a faster rate. How can the health industry not want to be revolutionised by IoT? Can they really afford not to embrace IoT? It seems that with IoT’s help they can do things that seemed impossible not so long ago such as reducing device downtime through remote monitoring and support, having a proactive fulfillment by replenishing supplies before they are needed, efficient scheduling by leveraging utilizing to serve more patients, and the monitoring of medical adherence. Also; IoT has the potential to positively impact the way health insurance companies operate- Oscar Health Insurance latest venture with Misfit is a great example of this. The early adopters of IoT technology was the manufacturing industry. They brought ‘smarter’ operations to their day to day business by integrating IoT sensor based technology into their systems and processors. Keith Nosbusch, Chairman and CEO of Milwaukee based Rockwell Automation believes that IoT is a “critical necessity to the future of competitive manufacturing”. Therefore it is with no surprise that some of the building blocks have already been put in place. Nosbusch acknowledges that IoT has resulted in some breakthroughs being possible because of a connected enterprise. So if one ponders about what kind of impact IoT is making to the manufacturing industry, the simple answer is the potential to manufacture faster and more profitably. When it comes to Retail, IoT seems to have breathed endless the possibilities and a new life into brick-and-mortar businesses. It is an industry that is already showing signs of revolutionizing the way retailers interact with customers. Using a mix of connected devices a store can tailor make promotions and experiences for customers. IoT can also help retailers, with things such as higher staff productivity, better security, better and faster customer service and better maintenance and warranty services. With IoT, retailers no longer have to imagine the possibility of being able to track inventory and consumers in real time, they simply can. An example of a fashion retailer using the power of IoT to truly personalise and enhance a customer’s shopping experience is designer Rebecca Minkoff. Her stores feature an oversize screen, where customers can browse merchandise or if they are in the fitting room they can use the installed touch screen mirror to ask for more items or ask for assistance- amazing. 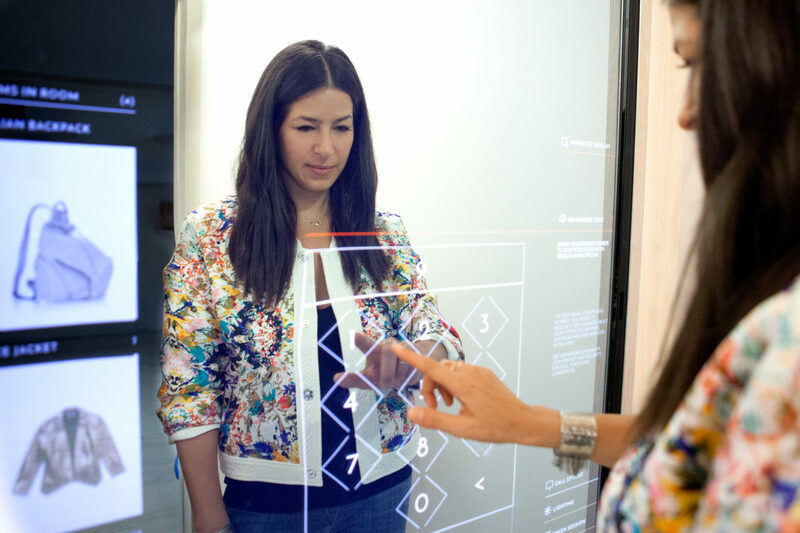 It is not only the consumers who are benefitting from Rebecca Minkoff’s advanced technological store, her employees all use iPads to handle shoppers’ requests and check out from anywhere in the store. Minkoff’s store is the first to use technology powered by eBay Inc.
With the health, manufacturing and retail industries looking to capitalise on the rise of IoT, what does it have to offer the personal consumer? Well imagine living in a world where as soon as you walk into your home the lights turn on (NuBryte), the heating turns up (Google Inc. Nest Smart Thermostat), the window shades lower automatically (Digital Storm) and perhaps the oven switches on in anticipation that you will need to heat up your dinner. It is a world that promises you not only the good life, but the easy life. It will be an IoT world where all the appliances and devices will be embedded with sensors and internet connectivity to ‘think’ and ‘act’ intuitively. The smart home concept is not yet available but the consumer Electronics Association projects sales of smart energy and security system with a total of $574 million this year (2015) which will be a 23% increase from 2014. So with all the excitement surrounding IoT’s advancement it will only be a matter of time before we are welcomed home by IoT. For the die-hard tech enthusiasts wishing to see progressive IoT ideas first hand, there is the 4-day CES gadget show in Las Vegas. This is an event where IoT companies exhibiting lay the foundation of what a smart home system will eventually do. Their aim is to entice the consumer and make sure that the devices they are looking to bring to market will not end up being a “novelty”. Their sales pitches are usually centred on how an IoT device will make the life of a consumer easier. CES is a place where you would be introduced to IoT products like Lucis Technologies NuBryte, a smart lighting device that can learn your behaviour via sensors. It will know to turn on the night light if you wake up to use the bathroom in the middle of the night. Another example is the coffeemaker from Smarter. Using data from fitness trackers like Fitbit, it is able to sense when you have had a bad night’s sleep and will make sure that the coffeemaker will make your coffee a bit stronger in the morning. How great would it be to be able to have gadgets that think about what you need before your need it? As exciting and innovative as IoT sounds, there is the serious note of security. When you hear stories of hackers already breaching Internet-connected camera systems, smart TVs and even baby monitors, how can you not quiver in your boots? The risks of unauthorized access will intensify as we adopt more devices that will be linked to our physical safety, such as our cars, medical care and homes. The challenge of security was first taken up by the early adopters of IoT. Their first excitement was damped with worry over security. Why? Because it seems that developers are not taking into account that the more devices connected to the internet the higher the risk to our safety and security. As emphasised by many, security cannot be an afterthought, consumers need peace of mind before they can invest in a technology that allows them to “live like the Jetsons”. Consumers cannot afford to wait for a catastrophe to happen first before the powers that be decide to take the required measures to lock IoT security down with strict guidelines. Joshua Corman, founder of I Am Calvary, puts forward a strong point, “if it’s got software, it’s vulnerable, and if it’s connected, it’s exposed”. You have to remember that as our dependence on connected technology grows, it is important that the security matches that growth or else we will be faced with an IoT security problem with no clear solution. That’s why I think that it is imperative that we, the consumer, need an authority that we can turn to should we need too. It is this authority that will lead the way and make sure that safety will always be at the forefront of IoT developers. Some of the major key players are acknowledging that when it comes to IoT security it is a matter importance. At CES, chairwoman of the Federal Trade Commission Edith Ramirez, explained that the trend towards having so many things constantly connected to the Internet presents a serious risk that start-ups and big companies need to take seriously. “Any device that is connected to the Internet is at risk of being hijacked.” Also at CES, Samsung CEO BK Yoon emphasised on the significance of a shared understanding achieved with open platforms and integrations whilst urging caution about security, “IoT must be secure and security must be baked into hardware and software at every level. Our whole industry must work closely together to make that happen”. Samsung who acquired Smart Things, an IoT company, in August 2014 have acknowledged that security of IoT is something that needs to be explored. Wi-Fi chip maker Electric Imp has tackled IoT security issues by coming up with a secure toolkit that is perfect for companies who do not necessary have the resources to do the security themselves. CEO and co-founder of Electric Imp Hugo Fiennes states “companies who build products can make use of the security work we’ve done, because you can’t add security to an insecure system”. There is also the argument that “only after disaster can we be resurrected” (Chuck Palahniuk). Implying that for IoT security to be taken seriously it might need to first hit rock bottom which will then give developers a second chance to create a better IoT device. This is an argument that I must strongly disagree with because the security of our personal data should not be treated like a learning experience, developers need to take on board that security cannot be something that can be added after the fact. Besides security, another big issue being raised in IoT is privacy. In 1999, Sun Microsystems’ CEO Scott McNealy infamously declared; “Privacy is dead, get over it”. Sixteen years later, I wonder, was McNealy right? With these words still ringing in many ears, I fear that have we have knowingly allowed our personal facts to be sucked, tracked and scoured through internet vendors that trade in personal data like Facebook and Google. Now, it seems our cries for privacy are falling on deaf ears. In a world where a billion devices are connected should we not be worried that these systems and services are exchanging our personal data? I am sure that as we enter the era of Persuasive Computing* that this new hyper connected world will decrease our privacy and potentially make it worse. This is because logically the increase in data volume and complexity results in less control, which will potentially leave consumers in a place where their beloved chips, sensors and wearables seal their privacy fate. Sounds quite bleak but there is light at the end of the IoT tunnel. The advantage of Persuasive computing is that it makes the issues of privacy readily apparent so the users (consumers) can be in the driving seat and take up the opportunity to control their own personal data. That all being said, I do wonder though, when it comes to privacy can we only embrace this next generation of technology if we adopt? Will relying on the government to protect our privacy be like asking “a peeping tom to install our window blinds”? (- John Perry Barlow) Should we have to give up our privacy and become bound by ‘their’ (dominant vendors) code? I would like to believe that when it comes to IoT Privacy, it could easily become our Achilles heel. With security and privacy quickly becoming the sacrificial lamb in the tech industry, I can only hope that the outcome will be the creation of the #TheKillerDevice. So will it be something like the iPhone, a technology that broke the mould when it introduced the concept of a multi touch interface smart phone to a generation in need of something fresh and new? I think simplicity and usefulness are key when it comes creating a consumer friendly device. Brett Dibkey (Vice President of Whirlpool Corp) put it best when he said, “the home adapts to the way consumers live rather than the other way around”. At the moment the IoT market is offering us smart thermostats and washer/dryers that use Wi-Fi for remote monitoring. Samsung “the biggest technology company in the world” (Venture Beat) is betting its entire future on ‘IoT’. At CES Yoon announced that IoT “is no longer a pipe dream”. Samsung are positioning themselves to corner the IoT market by planning to invest $100m into the developer community through the funding of start-ups including their very own incubators. Yoon wants Samsung to kick-start an Internet of Things revolution, with the promise that in about 2 years (2017) 90% of Samsung devices will be IoT ready and in 5 years (2020) 100% will be compatible with IoT. So what does the future of IoT hold? Can it really be a reality? Well IoT is certainly a broad and complex industry so I trust that no single standard organisation has the possibility of being the only entity to pull it all together. All voices must be heard in order for the vision and theory behind IoT to be realised. As Hosain Rahman said, when it comes to IoT, “it is important to build products and services that solve real user problems”. This is a point that I readily agree with, why would consumers embrace IoT gadgets if they are not a solution to a problem nor something they cannot live without? In order for IoT to truly realise its potential, it needs to be centred on what the consumer wants and needs. Gartner predicts that there will be about 26 billion devices on the IoT by 2020, ABI research estimates that more than 30 billion devices will be connected wirelessly to IoT and Vision Mobile Projects states that there will be about 4.5 million developers by 2020. With no shortage of predictions on how the IoT market will evolve, it is clear that it is a movement that promises to revolutionise the notion of the ‘connected person’ living in an IoT world.